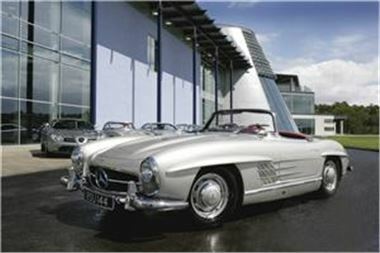 A Mercedes SL Roadster has been named as the car that would be most likely to attract male attention. Evecars.com conducted a poll to see which car men would be most impressed to a woman driving, with the classic convertible coming out on top. The model, which was manufactured between 1955 and 1963, was said to have impressive because of its association with the cinema. For example, a Mercedes SL Roadster was famously driven by Grace Kelly in High Society, a 1956 movie in which she co-starred with Bing Crosby and Frank Sinatra. Alex Jenner-Fust, editor of Evecars.com, described it as "undeniably a beautiful car which oozes style and class". She added: "Buying one isn't cheap, but proves the owner appreciates the finer things in life." Meanwhile, the poll found that many of the other favourites were performance cars, with a Porsche 911 also rated highly by men, along with the Mitsubishi Evo.